The authorization code or web server flow is suitable for clients that can interact with the end-user's user-agent (typically a web browser), and that can receive incoming requests from the authorization server (can act as an HTTP server). 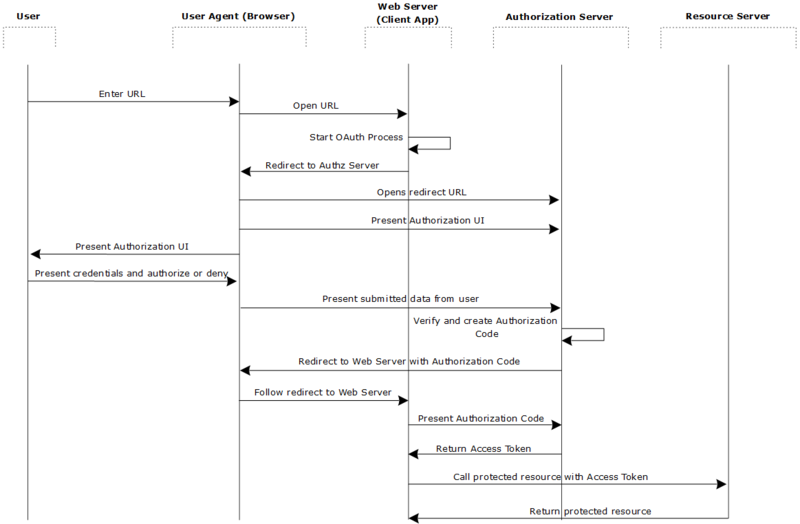 The authorization code flow is also known as the three-legged OAuth flow. 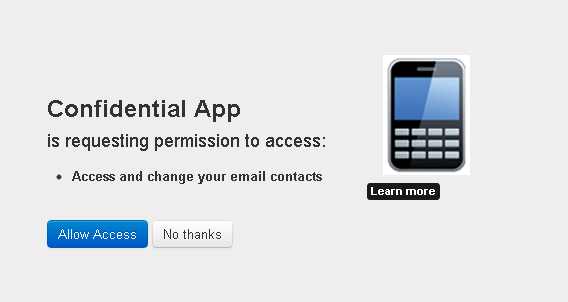 After the user approves access, the web server receives a callback with an authorization code. After obtaining the authorization code, the web server passes back the authorization code to obtain an access token response. After validating the authorization code, the API Gateway passes back a token response to the web server. After the token is granted, the web server accesses the user's data. Required. Must be set to code. Optional. The location where the authorization code will be sent. This value must match one of the values provided in the Client Application Registry. Optional. A space delimited list of scopes, which indicate the access to the resource owner's data requested by the application. Recommended. Any state the consumer wants reflected back to itself after approval during the callback. This value is used to prevent cross-site request forgery (CSRF) attacks, the consumer delivers this value to the authorization server when making an authorization request. For this reason, the value must be opaque, kept secret by the consumer, and known only to the consumer and the OAuth provider. Note During this step the resource owner user must approve access for the application web server to access their protected resources, as shown in the following example window. Required. Must be set to authorization_code. Required. The authorization code received in the redirect above. Required. The redirect URL registered for the application during application registration. Optional. The client_id obtained during application registration. Optional. The client_secret obtained during application registration. Note If the client_id and client_secret are not provided as parameters in the HTTP POST, they must be provided in the HTTP basic authentication header: Authorization base64Encoded(client_id:client_secret). A token that can be used to obtain a new access token. Provide login credentials to the authorization server. The default Client Application Registry user name is regadmin. When prompted, grant access to the client application to access the protected resource. Enter this value into the Enter Authorization Code dialog.